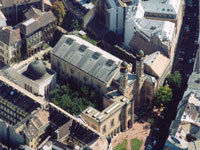 Situated within the charming old Jewish quarter of Pest, the Great Synogogue is one of the largest in the world. Its style is Byzantine-Moorish, with patterned brickwork in the red, blue, and yellow colours of the city's coat of arms. Gilded domed towers, archways, and beautiful windows make this one of Budapest's great landmarks. The splendid interior glitters with lights and gilded arches while balconies line the walls. The ceiling is covered in Stars of David and the floor is tiled in decorative stars. On Jewish festivals, it's packed with Jews from all over Hungary who come to celebrate within its splendour. Next door is the Jewish Museum, containing a Holocaust Memorial Room and relics from the Hungarian Jewish Community. In the courtyard is the Holocaust Memorial in the shape of a weeping willow tree, each metal leaf engraved with the names of those who have passed away. Address: Dohany utca 2-8 in VII district.